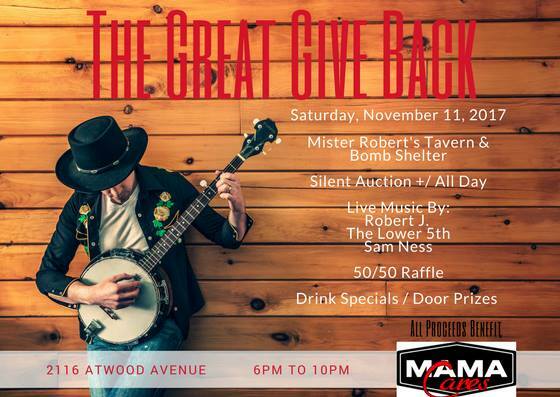 MAMA Cares Fundraiser the Great Giveback is this Saturday, November 11 at Mr. Roberts. The 4th Annual Breakthrough Artist Competition will be held at the High Noon Saloon on November 19. The Madison Area Music Association had one of its best years in its fiscal year ended June 30. It was a very productive twelve months that saw the nonprofit organization expand in significant ways. One of those efforts involved taking on the Clyde Stubblefield Scholarship Fund and absorbing the Coalition for the Recognition of Clyde Stubblefield into its fold, itself an organization that has its roots in the Madison Blues Society and the efforts of Joey Banks, longtime Stubblefield associate, apprentice and fellow band member. The Scholarship Fund has an initial fundraising goal of $25,000 in order to approach the Madison Community Foundation and create a permanent endowment. This is a fantastic development and a scholarship fund was in the organization’s original mission statement. At present the fund is almost halfway there with the first scholarship award present to Distant Cuzins drummer Ben Lokuta at the Madison Area Music Awards ceremony last June. Another program area that has seen significant development is the MAMA Cares initiative headed up by Robert J. Conaway. That program has established the Jacy Ray Fund, named after Conaway’s son who underwent serious brain surgery for an infection. The fund assists musicians and their families in times of health-related crises. This program, which has already benefitted families in the Madison area with $10,000 in assistance, was also drawn up in the vision of the MAMAs in order to address health insurance deficits in the music community. The fourth annual Breakthrough Artist Competition will be held at the High Noon Saloon on Sunday, November 19. This completion focuses on new acts, typically in existence for less than two years. Performers go through an application process where they vie for performance slots in the showcase. The winner gets a performance position in the Madison Area Music Awards show the following June. The other prize packages for this competition are meant to help make participating musicians more successful. This includes marketing assistance, professional recording/studio time, music licensing packages, and an opportunity to play to a large audience on a grand stage- at the Madison Area Music Awards show at the Overture Center … and more. Everything a new artist will need to present their music in a professional manner. The competing performers will be announced on November 9. It was a shock to us all when Tom Petty passed away in October. A tribute show featuring Wheelhouse, Driveway Thriftdwellers, Christopher Gold, Zach Pietrini and Brandon Beebe is set for November 24th at the Majestic Theater and is being presented by WOLX and Isthmus. Though not an official MAMA event the proceeds will be donated to the organization. Another significant development in 2016 contributed enormously to the success of the Association. Charley Goldstone, President of Frank Productions, joined the MAMA organization with a fundraising idea and a clear mission to help bolster the education support MAMA provides to local schools and learning facilities. 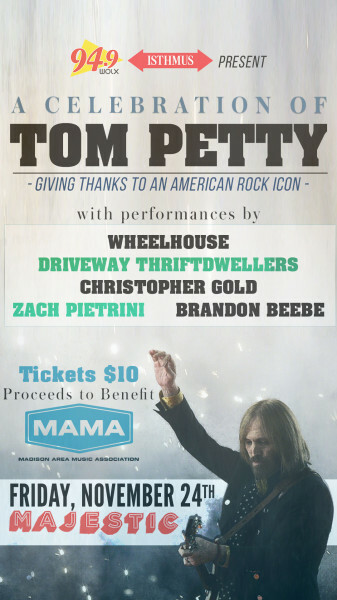 The MAMA Music Month was hatched for the month of October with many of the city’s prominent venues participating by donating 25 cents for every ticket sold during the month of October. This included many Frank Production events including Freakfest which can draw up to 30,000 attendees. The effort was a huge success and over $12,000 in instruments and funding was provided to school music programs and other music education facilities. It was a true coming together of the music venues for a common cause, a testament to the strength of their commitment to keep music education alive and support the efforts of the Madison Area Music Association. The Madison Area Music Association Awards will celebrate fifteen years in 2018. Registration for artists is open now. Follow this link to get your music into the system for awards consideration: www. http://themamas.org/awards/. This cycle will see the return of Latin genre categories for song, album and performer awards. Additionally, announcements will be made regarding the MAMA Hall of Fame and an additional induction ceremony for those who have won in a category five or more times. Stay tuned for more info.